Mimosa building owner Nancy Swanger: "I think generally we've been pretty good citizens in all the places that we've built and opened businesses." Everyone hates Mimosa. The stained stucco building sits at the eastern gateway to downtown Pullman, occupying a prominent lot between Main Street and the Palouse River. Its harsh turquoise paint peels from the awnings. Grime streaks the cracked and splintered cinder-block facade. One light fixture dangles from its wiring near the entrance. A jogger slows as she passes the building on a recent morning. "Pretty, isn't it?" she mutters before moving on. While this rural college town has seen rapid housing development and record-setting building permit applications in recent years, the Mimosa building has been decaying for two decades. 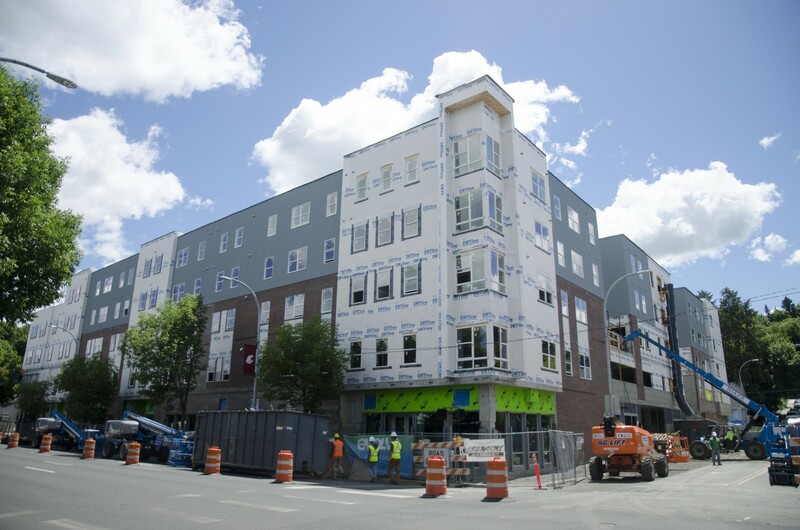 Now, one of the largest projects in the history of downtown — a $20.2 million mixed-use student housing complex called Evolve on Main — nears completion directly across the street from Mimosa, casting a starker shadow each day. Community members say the building keeps getting harder to ignore. Rumor becomes mystery becomes outrage. Why don't the owners fix it up? Why doesn't the city condemn it? Why won't somebody do something? Frustration has spilled into City Council meetings, local Chamber of Commerce discussions and newspaper columns. 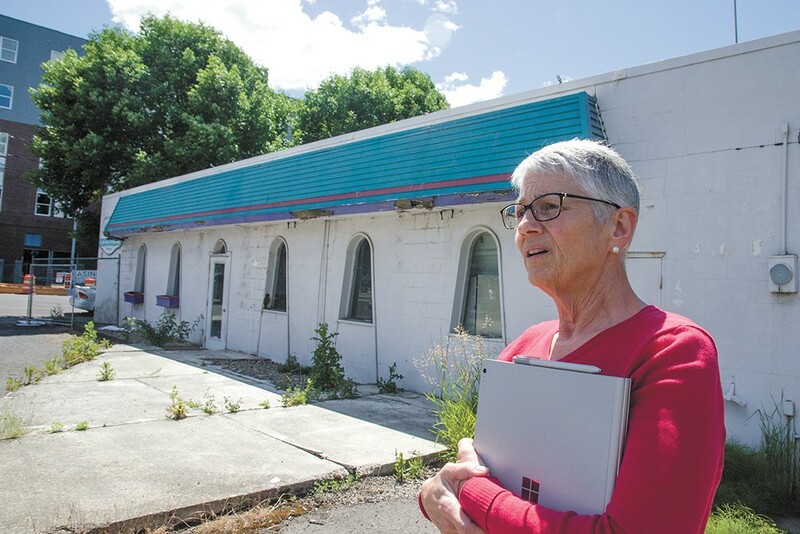 "No building rots the heart of downtown Pullman quite like it," the Moscow-Pullman Daily News editorial board writes of the property in April, later adding, "Mimosa's story is largely unclear to us." As it happens, the story involves a devastating flood, a broken-down bus, seven unidentified public agencies, an arson, a heavy metal band, "ninja landscaping" and the fastest Subway sandwich maker in the world. "These stories have become very tangled as of late," Mimosa owner Nancy Swanger says. "People are looking for everything to make us look like the bad guys, and we're not. We're not." The new Evolve building, located just across the street from the Mimosa. 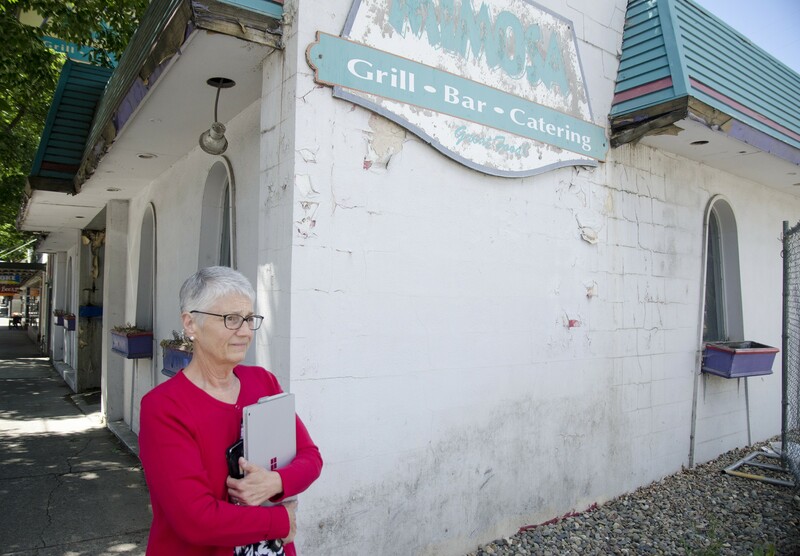 The Mimosa building has not really been the tropics-themed Mimosa restaurant since 1996 when the South Fork of the Palouse River breached its banks and swamped much of downtown in several feet of water. News reports state 20 Pullman businesses closed as floodwaters triggered mudslides and washed out bridges. Mayor Glenn Johnson says he volunteered with the cleanup efforts at the time and saw firsthand the extensive damage inside the Mimosa building. He expects it has only gotten worse, only half joking that he would not go in without a hazmat suit. "We have had our people look at it," he says of the current structure. "The building's solid. The doors are there. The windows are intact." As long as the building appears structurally sound, Johnson says the city cannot really force the property owners to do anything. It is their choice to fix it, sell it or let it rot. City officials still hear the complaints, though. City Councilman C. Brandon Chapman says the question came up more than maybe any other issue during his run for office last year: Can you do something about that Mimosa building? Some critics have called for boycotts of the owners' other businesses or heavy new fines to encourage action. "Some of the comments go so much further than that," he says. Garren Shannon, co-chairman of the Pullman 2040 community revitalization group, says the frustrations inspired some to engage in "ninja landscaping" last year. A few reverse vandals snuck over to plant flowers in Mimosa's window boxes and sweep out the doorway. "There is absolute public outrage on this," Shannon says. "People have been harping about it for years. ... I wouldn't want to necessarily condone trespassing, but that's how bad it got." While Johnson and Chapman have spoken with the owners, few others appeared to have reached out. Pullman 2040 has not talked to the owners. Marie Dymkoski, president of the Pullman Chamber of Commerce, says they have not taken an "active role" in the property. "We know who owns the building," she says via email, "we know the price and we know that community members share in the frustration of the building sitting empty, dilapidated and overpriced." Nancy Swanger says she and her husband, Larry, have lived on the Palouse for 41 years. They got their start opening up early Subway sandwich franchises in the late '80s, eventually buying a location alongside Mimosa's parking lot. They initially rented rights to allow customer parking. After the flood, they took an offer to purchase the lot as long as they also took Mimosa. "We joked for many years that we bought this parking lot with this crummy building attached," she says. "But we wanted to protect it. ... Parking downtown is at a premium." Nancy Swanger, outside the Mimosa building. Swanger says Mimosa was "disgusting" when they bought it. They know it still is. Her husband gutted the structure, pulling out kitchen equipment and booths. They never had a real vision for the property, she says, and they have gotten expensive estimates for renovating the property and flood-proofing the building. And one day while her husband trimmed weeds, a random chat with an unidentified city official also put them on edge. Swanger says the official warned them seven agencies have authority over permitting on Mimosa and the Palouse River shoreline. "That plants a seed in your head that makes you a little nervous," she says now. "Over time ... other opportunities probably came up that sort of took precedence, and it's just sort of sat there." The Swangers never clarified the warning or submitted any plans to the city. Nancy Swanger went on to work at Washington State University, where she now serves as associate dean and director of the School of Hospitality Business Management. They have sold off their Subway franchises as Larry has launched new restaurants in nearby Moscow, Idaho. "I think generally we've been pretty good citizens in all the places that we've built and opened businesses," Nancy Swanger says, noting they have given thousands of dollars to local causes. But some of those projects have also drawn public ire over delays and lack of communication. The Varsity Diner, a retro-styled restaurant with a mirrored chrome exterior, opened last year along Highway 95 in downtown Moscow, just a block off of Main Street. The Swangers bought the property at the high-profile intersection in 2004. At the time, it was a former gas station and auto repair shop. The Daily News reported Larry Swanger expected "something will be done within the year." The old Chevron station still sat vacant nine years later when a rundown bus appeared on the lot. City officials reported several public complaints, but concluded it didn't technically violate any junk vehicle or nuisance ordinances. They couldn't really do anything. "They had to look at [that bus] for a long time," Pullman Mayor Johnson notes. The Swangers also bought Gambino's Italian restaurant in Moscow with plans for a quick remodel and reopening. They eventually rebuilt the place to twice its size and reopened three years later. While the Swangers sold off their Subway franchises, they still own the overall building next to Mimosa, which also housed a barbershop and a Baskin Robbins. That building has seen a tumultuous two years as the barbershop closed, an arson fire heavily damaged the Subway restaurant and the owner of Baskin Robbins went to prison on child molestation charges. Nancy Swanger says the roller coaster of recent years has made it difficult to make progress on Mimosa and the community anger has left them feeling demonized. When the mayor takes those complaints to the WSU president, she says it feels very personal. "People have been really cruel," she says. "Frankly quite mean. ... Could you look me in the eye and say those same things? That's terrible. I would never talk or treat another human like that. And it's hard. It's very hard." If you want an idea of what the inside of the Mimosa building looks like now, Nancy Swanger says look up the music video for the song "Fragile Minds" by Silent Theory. Three of Swanger's sons play in the Moscow-based heavy metal band, and they filmed the video inside the gutted structure. In the video, band members carve messages of anguish into walls, smash bottles and head bang beneath exposed rafter beams. "Sell me," the singer pleads, "down the river." Swanger says she would love to sell off Mimosa and the Subway building lots to some bright-eyed developer — for $2 million. City officials say that price is far, far above market value. The county has assessed those properties at about $330,000, including just $60,000 for Mimosa and its parking lot. "They could make a counter offer," Swanger says, "[But] I'm not going to give it away." Shannon, with Pullman 2040, says it will take some private-market incentive to bring change to Mimosa. Or a generous donor, like the anonymous individual who recently gave the Whitman County Historical Society $300,000 to buy a rundown train depot nearby. Councilman Chapman says he has worked to put the Swangers in touch with a financial adviser to brainstorm options for offloading the property. Pullman City Supervisor Adam Lincoln says he would welcome a "what if" conversation with the Swangers to identify obstacles to development or discuss marketing options. "The owners have a history of making positive changes to the sites they own," he says. "It's unfair to paint them as anti-growth, anti-development, anti-city, if people aren't willing to talk to them. ... But again, both sides have to make that effort." The original print version of this article was headlined "The Spoiler"